Established in 1948 by Mario Sernesi, in the artisan ceramics district of Sesto Fiorentino, near Florence, Le Porcellane was founded by a far-sighted man who built up a successful business over the years, basing his progress on the values of tradition and quality. The handing over of the helm to the daughter Felicita Sernesi since 1979, and his nephew Giacomo Lucibello since 2004, represents that generational transfer typical of great artistic and artisan heritages. Giacomo has grown and developed within the company, both as a man and a professional, and it is with the passion and skill that he has inherited that he sets out on a journey which starts from the past and looks to the future. In 2008 founded Brigantino Srl, his new society that invested on new foreign markets and grown up the brand Le Porcellane Home and Lighting. Porcelain is the lynchpin of elegance and style and Le Porcellane has always interpreted this wealth, safeguarding a great tradition, enhancing it and creating a unique and absolutely inimitable style. Employing ancient sculpting methods to forge every item and hand decoration techniques, the new creations will always be based on the reference points of beauty, quality and preciousness. Mario Sernesi, a man of great insights founded the brand’s artistic Porcelain Manufactory in 1948 in Florence, a place already steeped in tradition and passion for the noble material. From the outset, the company could then enjoy a big privilege to start already with a production of the highest quality, given the experience and high professionalism of Tuscan artisan culture. The brand chose the finest porcelain that cooks to “gran foco” according to ancient traditions to 1330 °, and from this arises the depth and purity of white that makes the brand its “atout”. The abundance in the use of 24 carat gold, or platinum, the sign of the hand of man, the nature of matter and memory, make each object unique, precious and unrepeatable. 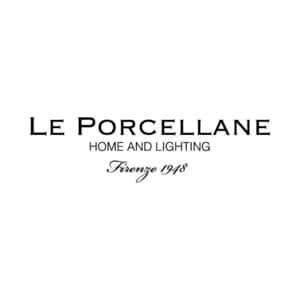 Manual intelligence and passion, respect and reverence for the history, art of know-how: Le Porcellane, Home and Lighting and is a senior of handmade in Italy. NEED MORE LE PORCELLANE INFORMATION ?